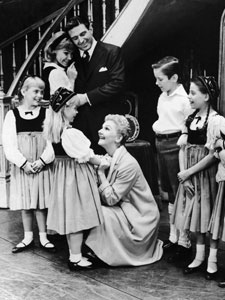 When we think about the U.S. movie, “The Sound of Music,” we think about the von Trapp family who inspired the Rodger and Hammerstein’s musical. Such a family did exist, and did indeed become an icon of a rich and fabulous music tradition. One of those who inspired this true story, Maria Franziska von Trapp, died on February 18th at age 99. She had lived a truly full life, and she and her family have given this world a truly beautiful gift. Maria von Trapp, the second eldest daughter of the famed Austrian Captain Georg von Trapp, suffered from heart problems ever since she was a child. To help his daughter, Georg von Trapp hired a governess, named Maria Augusta Kutschera, who used songs to help not only Maria but all of the children and George von Trapp overcome saddness when George von Trapp’s first wife had died. This tradition became an important part of the von Trapp family, and the von Trapp family became famous in Austria as the von Trapp singers. Eventually this governess married George von Trapp and became the children’s second mother. When Germany invaded and occupied Austria in 1938, the Nazis started the persecution of all Austrian Jews. The von Trapps, being Jewish, fled Austria for Italy before the Nazis could have either interned them in a concentration camp or had them killed. The von Trapps eventually made it to the United States where they stayed for the remainder of the war. The family toured the United States and gave singing concerts until the end of World War Two. Eventually many of the von Trapp family returned to Austria in 1945. Georg von Trapp died of lung cancer in 1947, and his second wife wrote a book about the von Trapp family in 1949. The Rodger and Hammerstein’s musical play is based on the book, and the famous 1965 movie “The Sound of Music” is based on that musical. The von Trapp story is an example of how life can be beautiful. Rest in peace Maria Franziska von Trapp.